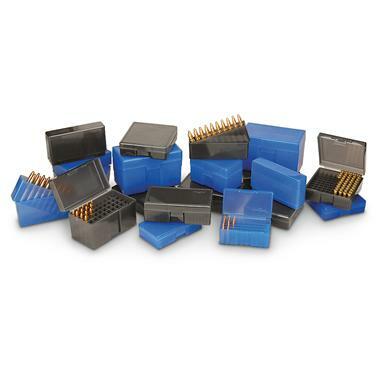 This flip-top, plastic Ammo Box is ready to provide a place for every caliber. Resistant to dust, dirt and rain... thriving where cardboard boxes would quickly disintegrate. See-through construction for easy identification of the ammo inside. A no-hassle storage solution for reloaders or bulk ammo buyers! Note: all Boxes are blue, no gray available. Order now!